Beef + Lamb Ambassador Chef, Scott Buckler recently showcased New Zealand lamb at the Amuri Show in the South Island. He demonstrated how to create an easy barbecue lamb dish which home cooks can use to impress their guests or use as a delicious mid-week meal. Scott is head chef at No.31 Restaurant & Bar in Hanmer Springs. 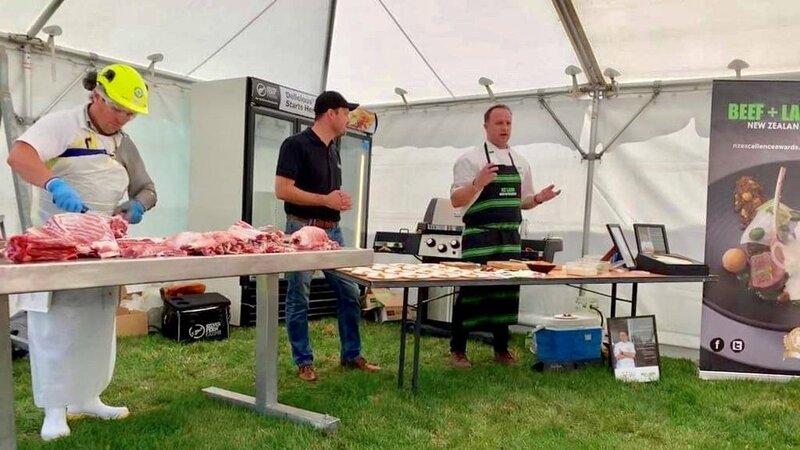 He says being able to showcase New Zealand lamb at the Amuri Show gave him the opportunity to demonstrate to visitors just how versatile and tasty lamb can be. Read on to find Scott’s recipe below. Marinate the lamb backstrap with 2 tbsp of the Moroccan seasoning and a splash of oil and heat the BBQ. In a bowl, add your couscous and 1 tbsp of Moroccan seasoning. Make up the chicken stock to 300ml of boiling water and add to the couscous mixture. Cover and leave for 5 minutes, then fluff the couscous with a fork and allow to cool. Roughly dice the red peppers, crumble the feta cheese and finely chop half the mint. Add these to the couscous and season with salt and pepper to taste. Grate the cucumber and place in a tea towel and squeeze out any excess liquid. Zest one lemon and chop the remaining mint. Place into the yoghurt and mix well. Season with salt and pepper to taste. Toast your seeds in a small pan on a low heat until golden. Place your lamb on the BBQ and cook to your liking aiming for a nice caramelised colour on each side. For medium rare the lamb should feel soft and have a springiness to it when you touch it with your finger. Rest the lamb to relax the meat to allow for a more tender eating experience. Place your couscous onto a plate and slice your lamb and lace on top.Drizzle your Tzatziki over the lamb and top with your toasted seeds and garnish with some coriander leaves. Plated up - easy BBQ Moroccan lamb with Tzatziki and couscous.